Not less than 18 years and not more than 23 years as on the closing date for the receipt of applications from candidates (i.e. 27-01-2015). Matriculation or 10th Pass with Science subject. Educational certificates other than State Board/ Central Board should be accompanied with Govt. of India notification declaring that such qualification is equivalent to Matric/10th class pass for service under Central Govt. Application on the proforma as per Appendix – ‘A’ (Given in Notification) should be sent to the authorities prescribed against respective States/UTs as mentioned below along with requisite application fees of Rs.50/- (Rupees fifty only) in the form of Postal Order drawn in favour of the officer mentioned under column 3 (See the Notification below) and payable at the post office as mentioned under column 4 (See the Notification below). SC/ST candidates are exempted from application fee. 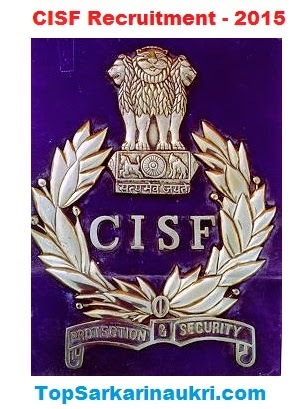 Application should be sent so as to reach the concerned Zonal DIG of CISF (as shown in the para-5 of Notification) by 27-01-2015 and in case of residents of North East region by 03-02-2015. No application will be entertained which is received after the due date.